Are you looking for something fun to do this weekend? Look no further! Downtown State College Improvement District has got you covered. 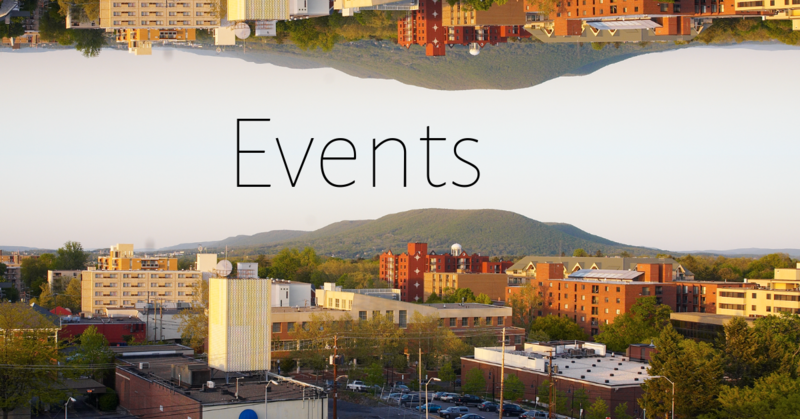 Continue reading to discover events happening in and around downtown between Friday, March 29th and Sunday, March 31st. Enjoy! PSU Men’s Tennis vs. Minnesota at 5pm. Latin Dance Mixer from 6 – 9pm at State College Municipal Building. No partner or experience necessary. PSU Women’s Softball vs. Wisconsin at 6pm. Wisecrackers Comedy Show from 7 – 8:45pm at The Basement Nightspot. Headlined by Mike Burton and featuring Chris Monty. Emcee is James Tierney. 21+ event. Tickets are $20. Friday Night Live from 7 – 9pm at Webster’s Bookstore & Café. Hosted by Centre LGBTQA Support Network. Bat Boy the Musical at 7:30pm at FUSE Productions (1108 S. Pugh Street). Rabiyatu Poet from 9 – 10pm at Webster’s Bookstore & Café. Swag Giveaway & Photobooth at Champs Downtown from 8pm – 1am. Kristi Jean & Her Ne’er Do Wells at Doggie’s Pub from 10pm – 1am. The Nightcrawlers at Bar Bleu at 10:30pm. Live Music at Lila Yoga from 10 – 11am. Featured artist: Shalom Dubas. Montecristo March Madness from 11:30am – 2:30pm at Your Cigar Den. Fill out a bracket and get a Montecristo cigar for a dollar! Metropolitan Opera presents: Die Walkure at 12pm at The State Theatre. Tickets range from $20 – $28. Circular Weaving from 12 – 2pm at The Makery. Free Repair Café – Spring Bike Tune-Up from 1 – 3pm at The Make Space. PSU Women’s Softball vs. Wisconsin at 3pm. Earth Hour Candlelit Dinner from 5 – 9:30pm at Juana’s. Free light refreshments will be served from 8:30 – 9:30. Camp Kesem Make the Magic from 6 – 10pm at Days Inn Penn State. Winter Jam from 6 – 10pm at Bryce Jordan Center. Earth Hour Party from 7:30 – 10pm at Webster’s Bookstore & Café. There will be a screening of National Geographic’s film, Paris to Pittsburgh, at 6:15. As part of the world wide Earth Hour celebrations, we will go lights out and all-acoustic from 8:30 – 9:30. John Solo at The Brewery from 10:30pm – 1:45am. Corner Brothers at Doggie’s Pub from 10pm – 1am. Ladies Night of Hip Hop/R&B at The Basement Nightspot. Cover proceeds donated to Centre Safe. Sunday Music and Vegan Brunch with David Paluzzi from 10am – 2pm at Webster’s Bookstore & Café. Brunch served 10am – 2pm, live music from 12 – 2pm. PSU Men’s Tennis vs. Wisconsin at 11am. Jazz Brunch from 11:30am – 1:30pm at ZBAR. PSU Women’s Softball vs. Wisconsin at 12pm. Fortify Your Foundation from 1 – 3:30pm at Yoga Lab. State of State from 3 – 7:30pm at The State Theatre. Health Night from 4 – 6pm at Abba Java Coffee House. PSU Men’s Tennis vs. St. Bonaventure at 5pm.